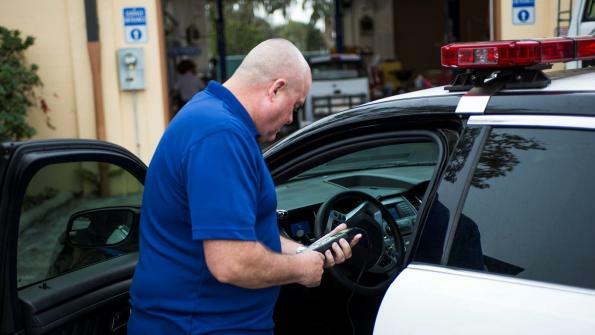 As with most law enforcement departments, the local police in Longwood, Fla., primarily use their vehicles as mobile offices. This means that the department’s vehicles often spend hours idling, and some days they idle up to 70 percent of the time. Police fleet managers were looking for ways to cut down on idling fuel costs and save money. As with most law enforcement departments, the local police in Longwood, Fla., primarily use their vehicles as mobile offices. This means that the department’s vehicles often spend hours idling, and some days they idle up to 70 percent of the time. Police fleet managers were looking for ways to cut down on idling fuel costs and save money. As a result, they hired Sanford, Fla.-based Derive Systems to optimize fuel efficiency and improve performance for the fleet. After testing and evaluating Longwood’s fleet, the company decided the best solution for the department would be to adjust the police cruisers’ RPM levels while idling and cruising. The company also made several performance tweaks to the fleet. In the photo above, the system is being installed in a cruiser. These decreases in cost and fuel usage provided a better return on investment than expected. In addition, by lowering fuel usage, the department has reduced its carbon footprint. Click here to learn more about Derive Systems.